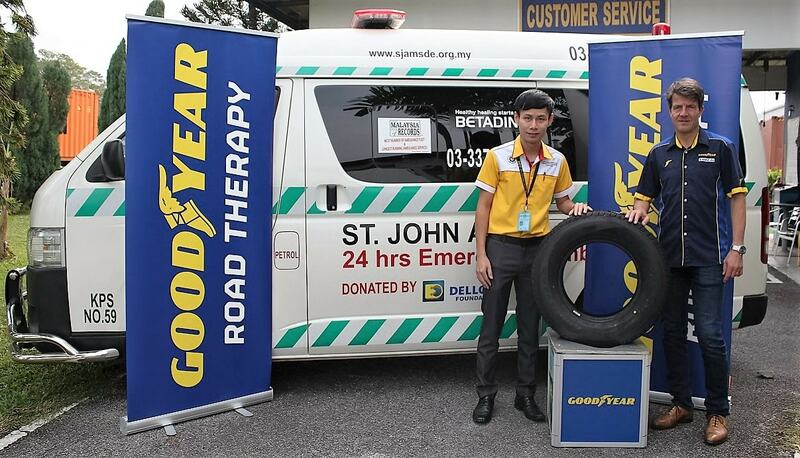 Goodyear Malaysia continues to provide support for the public health and safety services in Malaysia by donating high performance a quality tires to St. John Ambulance of Malaysia for the eleventh consecutive year. Goodyear first sponsored St. John Ambulance Malaysia back in 2006. This year,it is sponsoring 16 new sets of Durasport tires, which will be fitted to St John Ambulance’s Toyota Hiace vehicles. From left, Mr. Lim Ju Keong, Purchasing Executive of St John Ambulance Malaysia and Mr. Ben Hoge, Managing Director of Goodyear Malaysia Berhad, together with one of the 16 pieces of 195R15C tires donated to St.John Ambulance of Malaysia. As part of Goodyear’s Shared Values in caring for the environment and communities, this initiative represents the company’s corporate social responsibility (CSR) value which focuses on the improvement and betterment of the well being of the local communities where the company’s operations are based. “Goodyear Malaysia has always held St. John Ambulance in high esteem due to their contributions to the society. We share the same values in striving to provide quality support to the community, and recognize St.John Ambulance’s efforts in providing emergency medical aid service. Therefore, we at Goodyear are proud that our tires have played a part in serving those in need throughout thiseleven-year milestone,” said Ben Hoge, Managing Director of Goodyear Malaysia. St. John Ambulance started in the early days of the Industrial Revolution, addressing the needs of the sick and the injured, and bringing them to hospitals for immediate attention. In addition to rendering first-aid and home nursing services, the organization also carries out community projects such as mass Cardiopulmonary Resuscitation (CPR) training, Citizen Action and Response in Emergencies (CARE), and other initiatives. Through volunteer services and the assistance of individuals and corporations, such as Goodyear, St. John Ambulance will be able to advance towards its vision of being a well-organized body that is dedicated to the service of mankind.